It’s a snowy last day of 2012 here in Kansas City and I’m using the time to go through a bunch of things I bookmarked a while ago. A few months back I was searching for new table lamps for the bedroom when I came across “Half Nelson” designed by George Nelson Office, circa 1950. The lamps are being produced by Modernica in Los Angeles to the exacting standards of the original lamps produced by Koch & Lowy from 1977 until they were discontinued in the late 1980’s. George Nelson originally designed the ‘Half-Nelson’ Table Lamp for the Holiday House project, a commissioned design vacation home for the publishers of magazine bearing the same name. The house was built in 1950 on the southern coast of Long Island where it was intended to showcase the magazine and to promote a post WWII economy where anyone could afford to own a vacation home. George Nelson designed the home and most of its furnishings. The ‘Half-Nelson’ was designed specifically for the living room, and originally existed only as a prototype. Posted in Design and Art, Lighting and tagged Design, George Nelson, George Nelson Office, Half Nelson Lamp, Holiday House, Industrial Design, Lighting, Modernica on December 31, 2012 by Author. Separated at Birth, I-Sit vs Papa Bear. This morning when I was going through my RSS feeds of daily inspirations, I came across a piece about a new chair designed by “Design Concern” and manufactured by Magnus Olesen. The new “I-Sit” chair is really nice looking, but I said to myself, “What does this remind me of?” and then it hit me. 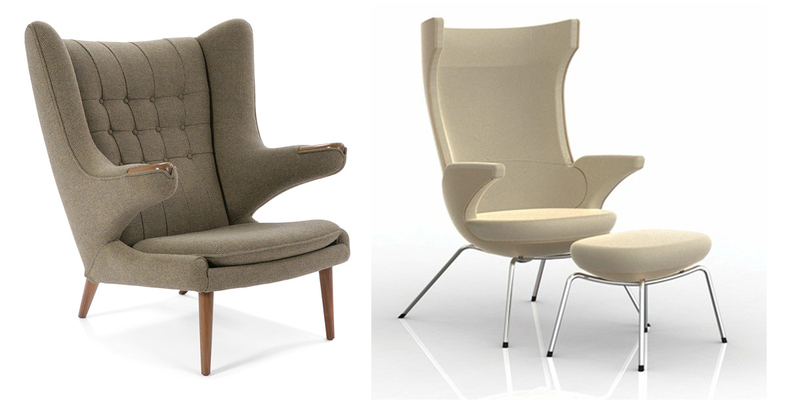 Hans Wegner’s iconic “Papa Bear Chair and Ottoman from 1951. Now don’t get me wrong, I think the I-Sit chair is stunning. There are elements of it that remind me of Marc Newson’s design work for the Ford C21 concept car, and it definitely draws inspiration from Hans Wegner’s Papa Bear chair. The I-sit has wonderful lines, and from what I can tell it adds another level of comfort by allowing the person sitting in it to recline the chair. The chair is built up around a pressure moulded shell with slim legs of steel which give the design a both light and characteristic expression. 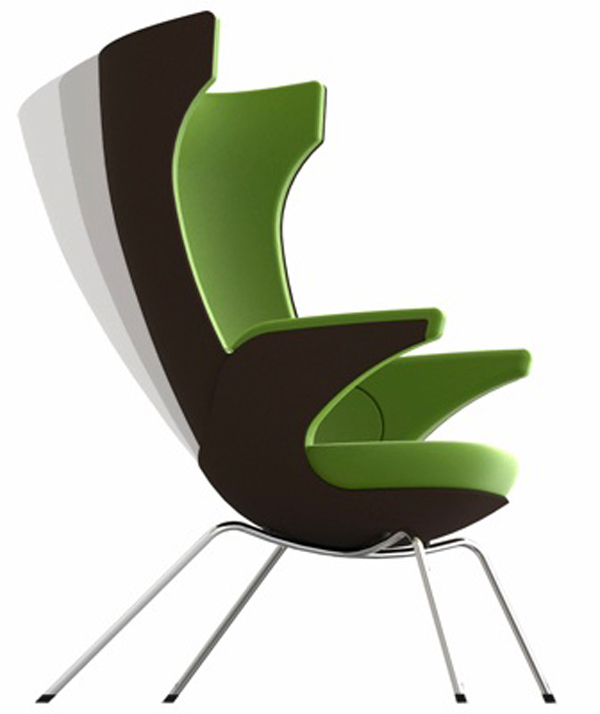 The I-sit is the winner of a prestigious Red Dot Design Award, and is so deserving. It is a beautiful chair in its own right. The thing is, I keep looking at that Hans Wegner chair, and thinking I’d rather own it. 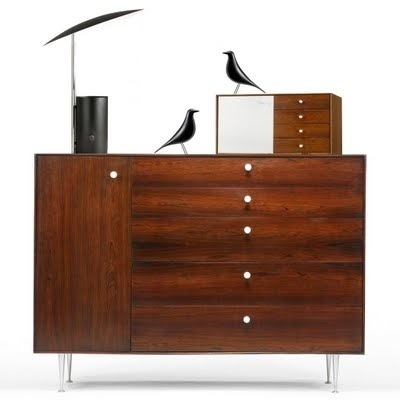 Posted in Furniture and tagged Design Concern, Ford C21, HAns Wegner, I-Sit, Magnus Olesen, MArc Newson, Modernica, Papa Bear Chair on July 8, 2010 by Author. About 8 years ago, I bought the “Annie” bed frame from Blu Dot furniture. Annie is a wonderful Baltic birch plywood frame with design influences that harken back to Haywood Wakefield designs from the late 40’s and early 50’s. The frame itself has a look that could be viewed as mid-century modern, and at the same time updated to a truly late twentieth century look. The old bed worked great in the old house. The size and shape fit the room well it looked solid, and anchored the room well. In the new house, it works sort of. The issue that I have is the size of the headboard. Because of the height and width of the headboard there is really only one location that the bed will fit, and that is the East wall away from the windows, and in an area that I would like to use as a sitting room where I can put a small TV or media center. The solution to the problem is the Case Study V Leg Bed from Modernica. The iconic V-Leg design is influenced by the concepts of California Arts and Architecture Magazine’s Case Study House Program (1949 to 1965). The Case Study project, which concentrated on the Southern California area oversaw the design of 36 prototype homes, and sought to make available plans for the residences and furnishings that could be easily and inexpensively constructed during the post World War II building boom. 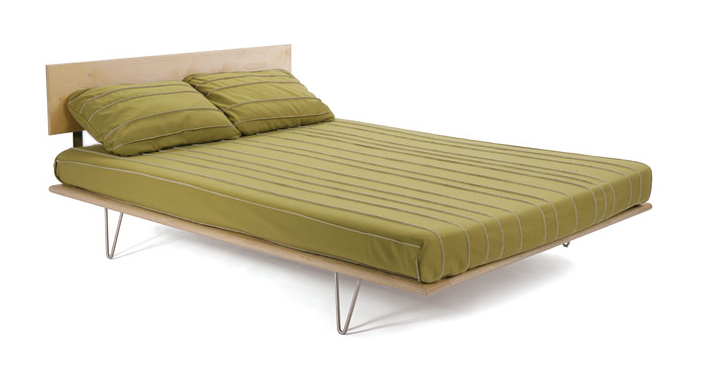 Modernica’s V-Leg Bed like the Annie bed is constructed of 26-layer birch finish grade plywood. Unlike the Annie bed which uses wood slats, the Case Study bed uses a perforated steel mattress support. More importantly though is the overall size of the frame. The headboard on the Annie bed angles up from its base to a full six inches wider than the width of a King Mattress, and the height is a full two inches taller than the base of the windows. The Case Study bed however is a series of straight lines with a maximum height of just 30 inches. Height from the floor is the same, the bed sits low to the ground, and the metal legs visually drop from view helping to create the illusion that the bed floats above the floor. With an 8 to 12 week manufacture and delivery cycle, I should have the new bed by the end of January. Just in time to start rearranging the walls in the house again, and figure out what to do with the old bed. Posted in General and tagged Arts and Architecture MAgazine, Bed, Bed Frame, Blu Dot, Case Study House, Modernica on December 14, 2009 by Author. The Bubble Lamp is Go. Yesterday when I got home from the trip I had the nice surprise of finding the George Nelson Criss Cross Bubble lamp installed above the kitchen island at the house. It looks fantastic. There is a nice visual break in the line of sight across the ceiling without being to obtrusive to the flow of the room. 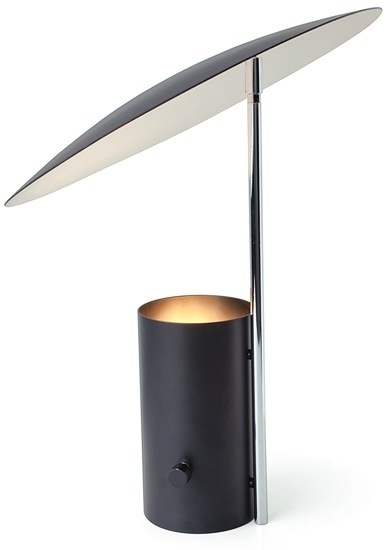 The light it emits has a wonderful diffused pattern that subtlety hints at the overall shape of the lamp itself. I love the look of the stretched white plastic membrane across the wire framing. The chiaroscuro of form created by the undulating bends in the elliptical shape of the lamp is punctuated with dark contrasting lines from the wire structure beneath it. According to our handy man the installation was a snap. The light came with all the wiring and attachments, plus a face plate that perfectly covered the hole from the existing recessed fixture. Installation time took about 30 minutes and this included removing the original lighting fixture that was installed in the ceiling. I’m curious to see how the light is going to hold up and how easy it will be to clean it under normal conditions. The plastic membrane that is stretched over the wire frame seems extremely durable but it is hard to tell. I’m wondering about things like discoloration, which I know was an issue with the original Nelson lamps from the 50’s and 60’s. I’ll be making additional posts about the lamp as we use it more and I have a chance to see how it holds up under daily use in the house. Posted in Architecture, Design and Art, Product Reviews and tagged Bubble Lamps, Design, George Nelson, Herman Miller, Lighting, Mid Century Modern, Modernica on October 13, 2009 by Author. The new Saucer Criss-Cross Nelson Bubble Lamp arrived today. We got it from of all places Gump’s in San Francisco. Yes Gump’s. I have no idea why they carry them but they do. Originally we were going to get the Cigar lamp for the old house, (the floor standing model) but with the new house we have gone for a ceiling mount lamp. We bought from Gump’s because we had a 300 dollar credit there and it covered most of the cost of the lamp. It’s funny on the receipt that was in the box it said “Gump’s Basement”, which makes me wonder if these are remainder items from a few years back when Mid-Century Modern was the hot decorating style. We have decided to hang it in the house above the kitchen island at the end of a 3 light run. The position is perfect for it since it will center out in the second module of the home, and create a visual break in the large open room that functions as Living Room, Dining Room, and Kitchen. The electrician won’t be out until after Tuesday, so I am not going to see this installed until after get back from South Africa. None the less I am excited because the lamp looks so awesome. The lamps are manufacture to exact specifications to the original manufacturing process by Modernica of Southern California. The first Bubble Lamp was designed by George Nelson in 1947, and produced by Howard Miller starting in the early 1950’s, only to end production in 1979. The Bubble Lamp is featured in the permanent collection of the Museum of Modern Art in New York. When I get back, I’ll post photos of the light in its new location. Posted in Architecture, Design and Art, General and tagged Bubble Lamps, George Nelson, Herman Miller, Lighting, Mid Century Modern, Modern Interiors, Modernica, Museum of Modern Art on September 26, 2009 by Author.